Bejeweled Blitz. Diamond Dash. Even Angry Birds. None of these games has the power and influence the that the simple, bright, family-friendly Candy Crush Saga has. To prove it, the “sweet” little game from 2012 has overtaken Angry Birds as the most played game on Earth at 600 million game plays PER DAY on mobile devices alone. It has even gained so much traction internationally that Korean pop star Psy featured it in his “Gentleman” music video earlier this year. Part of the Candy Crush popularity is its “cross-platform” nature, meaning you can play it on any tablet, computer, or smartphone — or even on Facebook — and be able to continue right where you left off, regardless of the device or your location in the world. I spoke with King Games Guru Tommy Palm about the Candy Crush phenomenon and how big games can start with small ideas. What was your career path? How did you end up at King Games? I started making games for Nintendo 64 in ’86 at age 30. Since then, I’ve been super-into making games. I’ve created a couple of different companies and I’ve had many different roles in making games. I joined King about 1 1/2 years ago and we started out with a mobile development. Did you attend college? What did you study? I studied Computer Science at the Royal Institute of Technology in Sweden. How did the idea for Candy Crush come about? On King.com, we have more than 150 smaller, one-level games and that’s an important part of the recipe we have for making games, so we innovate and try out new concepts there. We had already done several different “match 3” games. A rather small team of three people wanted to make a candy-themed game with a new innovative thing that you could combine to power up candies to create a food type and that changed the dynamic a little bit from the traditional “match 3” games. We saw on the website that it was very popular from the total audience we have there, which is currently about 12 million active players. The mean demographic there is women between 25 and 55 and the game did very well with that target audience, so we first took it forward to Facebook in April 2012. The Facebook version added the multiple levels and ‘social envelope,’ as we call it, when you have the map where you see where all your friends are and it worked really well. At the end of November, we added the mobile version, so the game really became cross-platform, wherein you could continue your gameplay from, say, riding home on the bus and you could pick it up on other devices and continue where you left off. What is it specifically about Candy Crush that really makes it stand out in a sea of similar “match 3” games like Bejeweled and Diamond Dash? I think it’s a combination of several different things. One is the candy theme; it’s very popular. A lot of people have positive feelings towards candy, ever since they were children. Another thing is accessibility of the game. You can download it on any device and it’s free to play, so it’s easy to download and try it out. It’s also very simple mechanics, so it’s easy to get into and easy to understand. We have a lot of first-time gamers who haven’t played games before or didn’t traditionally see themselves as “gamers” who just love this concept. The last factor is, of course, the social component. People who connect the game to Facebook, which is voluntarily, play a lot more and they have more fun, because they see where their friends are and they can interact and compete with them. Candy Crush is the biggest game around! How many players are currently invested it? Wow, that’s insane! Are you able to tell us how many new players you get per day or per month? Yes, but those are not the figures we give out publicly, but currently, we have 70 million daily active players among our games. We do a lot of data gathering. We collect more than 2.5 million data points a day and we have people in the office who can analyze that and share the information with decision makers and game designers and people throughout the company, so they can decide on whether they need to tweak a level and make it easier or harder. It’s an important thing that the video games industry turned into that we now have that kind of relationship with customers that we can interact with them directly and see if there are problems somewhere that we can solve. Why do you think Candy Crush Saga has such international appeal, especially with the foreign market. It was featured in one of Psy’s music videos and Hong Kongers are playing it obsessively. I think it’s a couple of things. Again, I think the candy theme is one thing that works internationally. Another thing is that we see a very strong trend now with the cross-platform games. Bubble Witch Saga and Candy Crush Saga were two of the first games in the world that really was cross-platform this way, where you have the synchronized progression, plus if you buy something on one platform, you can access the same goods on other platforms. That is something that is coming up now and only going to be bigger and bigger, so I think we caught that trend at a very good time. With the explosion of smartphone devices, there are so many potential gamers out there now. Many of these people haven’t had access to a game platform and wouldn’t go to a store and pay $60 for a game, so for somebody who hasn’t been in a gamer’s demographic before, it’s just very easy to download something for free that their friends recommend, that they trust, and then they see that “Wow, this is a ton of fun” and a very accepting kind of entertainment. What is the process that goes into developing a game/app like Candy Crush? For us at King, it starts with a small team of 2-3 people that tries out the concept. We produce it in Flash and we publish it on our King.com site and see how well it’s received there. We can very easily tweak it and do changes there, where we have the core mechanics. Then we have a bigger team with 8-10 people that brings it onward to Facebook with the social components and builds the bigger world. We have another team that rebuilds the game, so it runs really smoothly for the smartphone and tablet devices. I read online that King releases a new game every month. That sounds like a lot of time and personnel! One of the key secrets behind that is to have smaller teams that focus on being able to innovate and try the games out really quickly and experiment with them. In the traditional game console world, you have a huge team working on production for a very long time before you can really see whether it works or not. But here, we can do some vetting much faster, test it out, change it, and then when we know, we can build it and do something bigger. What does King have coming up that you can talk about? 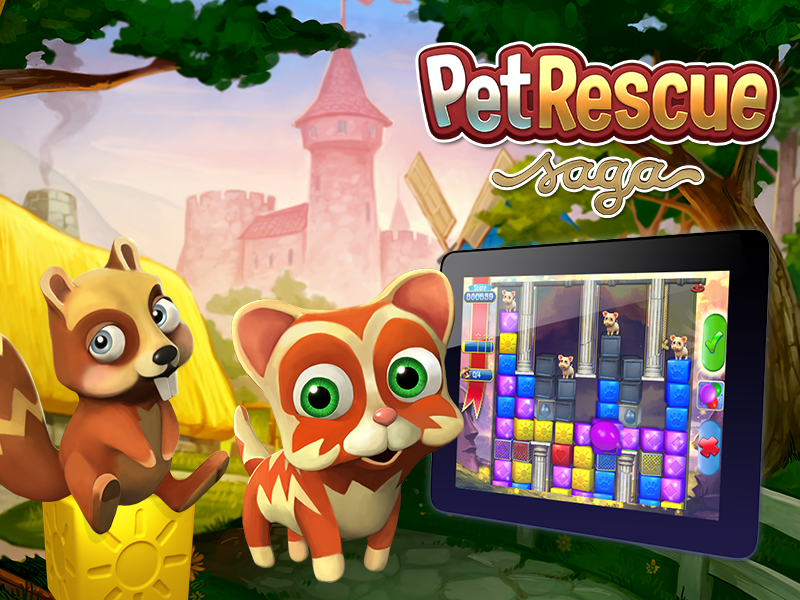 We recently released our third cross-platform game called Pet Rescue Saga. It’s another type of game, but still similar to the concept of Candy Cross Saga, so we’re looking forward to seeing how it goes. The other thing that is new is our first merchandising deal that was revealed a few weeks ago, where we are making Candy Crush Socks with a company called Happy Socks, so it’s a fun thing for the fans who love Candy Crush and we think that will put the smile on their faces. Has King ever thought of branching out into video game territory, meaning games for consoles? I mean, at their core, our games are cross-platform games, so they’re not really dependent on a specific device. It’s not ruled out that we could do something for anything like a Smart TV or new consoles, but we are looking to something that is as accessible as smartphones. If we feel a lot of players ask for another platform, then I feel we would definitely think about doing that. Our concept of cross-platform games implies that we’re open for making it available on the platform closest to the players. EASTER FUN WITH THE CANDY BUNNY! very sweet blog and it content very useful information about the Candy Crush Soda Saga also so it is the right combination of information and printing keep doing that in future also..
Can you please help with the crash on Jan 11? At least let players know if it can and will be fixed.